Lowell Digisonde International (LDI) has received a Phase II award from the Small Business Innovation Research (SBIR) Administration to develop and validate the Lowell Oblique Ionogram Autoscaler (LOIA), an intelligent software system capable of identifying oblique echo traces in images of the oblique-incidence (OI) sounding of the ionosphere. The LOIA technology extracts the OI traces from the ionogram image using an expanded ARTIST algorithm, synthesizes the first-guess OI model traces, transforms the model traces until they agree with the observed ones, and produces thus identified and interpreted OI ionogram traces for their subsequent use in the specification of the ionospheric plasma distribution. The first-guess synthesis algorithm uses a composite-quasi-parabolic representation of the measured vertical profile at the receiver site to estimate the propagation paths from the transmitter to the receiver assuming a spherically stratified ionosphere and neglecting the magnetic field. The LOIA output includes detected and interpreted traces and their important properties, including the Maximum Usable Frequency (MUF) for different modes of signal propagation. The data management infrastructure at the Lowell Giro Data Center (LGDC, http://giro.uml.edu/) will support the evaluation of the LOIA quality metrics, including interactive ionogram analysis software for the manual OI ionogram interpretation. Vertical- and oblique-incidence ionogram measurements provide the most accurate and reliable specification of the bottomside ionosphere dynamics in near-real-time and fine detail. Digisonde® DPS4D networks exist in Europe (e.g., see NetTIDE project), South Africa, Korea, and China that operate synchronously. With the ability to automatically extract and identify the OI traces, the ionospheric weather monitoring by means of the oblique sounding becomes an operational reality. Assimilation of these data into an ionospheric model like IRTAM (http://giro.uml.edu/IRTAM/) or GAIM will enhance the accurate real-time representation of the global ionospheric electron density distribution. In 2016 LDI delivered five Digisonde® 4D (DPS4D) Systems to customers in the USA and abroad. As with all DPS4D systems, each system is carefully assembled , calibrated & tested by our engineers at LDI manufacturing and testing facilities located in Lowell, Massachusetts. With the addition of these systems LDI has expanded the Digisonde® sounder network for the Global Ionospheric Radio Observatory (GIRO). LDI expects to deliver an additional three to five DPS4D systems in 2017 and early 2018. Prof. Arne Skjeltorp of the Norwegian Academy of Sciences presented the medal on behalf of the International Space Weather and Climate Committee during the European Space Weather Week in Liège, Belgium on 20 November 2014. Candidates for the Kristian Birkeland Medal must have demonstrated a unique ability to combine basic and applied research to obtain useful products, preferentially being used outside the research community, or across disciplines in research. The work must have led to a better physical comprehension of solar or terrestrial phenomena related to space weather, to a drastic improvement of the modeling, or to a new generation of instruments for space weather observations. The citation for Bodo Reinisch reads “For outstanding scientific results in the field of space weather”. The Birkeland Medal award honors his research and development work during his long years at the University of Massachusetts Lowell and since 2010 at Lowell Digisonde International, resulting in 300 publications in peer reviewed scientific journals. Anticipated Benefits. Unambiguous measurement of the topside electron density profiles will provide unique data for the specification of the topside electron density distribution, which is otherwise only provided by incoherent scatter radars at a few points and at limited times. Assimilation of these data into an ionospheric model like IRI RTAM or GAIM will for the first time provide an accurate real-time assimilative model for the ionospheric electron density specification up to the spacecraft altitude (~1000 km). A fleet of topside satellites with DPTIS can provide near real-time high resolution maps of foF2 and hmF2 over the oceans and land, complementing the ground-based Digisonde GIRO observations, as well as global near real time specifications of the topside electron density profiles which are affecting all transionospheric radio signals, including GPS. Ionospheric research missions in the F layer, both above or below the F2 peak, for detailed studies of equatorial spread F and scintillations, or auroral and polar cap irregularity structures can easily be carried out with DPITS because of its flexible programmability. The COSPAR/URSI Inter-Union IRI Working Group invites you to a one-day "Task Force Meeting on the Real-Time-IRI" in Lowell on 19 May 2014. UML/LDI invites you to the International GIRO Forum IGF2014 in Lowell, MA during the period May 20-23, 2014. The Forum will discuss the latest system news of the Global Ionosphere Radio Observatory (GIRO) and the Lowell GIRO Data Center (LGDC), review data dissemination and archiving, and discuss new measurement capabilities and applications. The IGF2014 will focus on oblique ionogram observations, measuring traveling ionospheric disturbances (TIDs), and the Ionosphere Real-Time Assimilative Model (IRTAM). The new Vary-Chap topside electron density profile model will be introduced, which replaces the -Chapman profile in ARTIST-5. Lowell Digisonde International, LLC has received a Phase II award from the Small Business Innovation Research (SBIR) Administration, for the development of a Small Satellite-based System for Active and Passive Sounding of the Ionosphere, Direct Current (DC) through High Frequency (HF) for the Air Force Research Laboratory (AFRL). Lowell Digisonde International, LLC has received a Phase I award from the AF Small Business Innovation Research (SBIR) Program, to develop a tool capable of simulating 3D HF propagation through a flexible ionospheric environment. Raytracing will be done through the 3D IRI (International Reference Ionosphere) with superimposed TID modulations. The calculated angles-of-arrival and Doppler shifts will be used to reconstruct the TIDs of the simulated TIDs. For many decades the ionosonde has been the work horse of ionospheric research. From the discovery of the ionospheric layers and their diurnal and seasonal variations to ionospheric dynamics and spread F, ionosondes have provided the basic measurements. Over time the ionosonde itself underwent a steady development from a relatively simple analog instrument to a highly sophisticated digital radar system, and the initial ground-based observations extended to satellite borne topside observations. Papers on significant ionospheric research with ionosondes from ground and satellites and on the development of ionospheric sounders are solicited. This new instrument design for a small satellite, incorporates the specifications for an RF Topside Ionospheric Sounder (TIS), with double probe electric field sensors. Six 7.5-m booms, configured into three orthogonal 15-m tip-to-tip dipoles and 3 orthogonal double probes, are assumed. The proposed "DPTIS" instrument can be flown within or above the ionosphere. The TIS design scans frequencies from 1.0 - 30 MHz and specifies the wave polarization (O/X) in the ionograms and the echo angle-of-arrival for ionospheric skymaps. The TIS design uses LDI/UML heritage from the IMAGER/RPI instrument and ground-based Digisondes® , and provides high programming flexibility to accommodate diverse spacecraft orbits. Ionogram/radio-skymap cadences of 10 seconds will provide high spatial resolution. Autoscaling software can derive real-time electron density profiles from the spacecraft. The double probe measurements use isolated spheres mounted at the end of the 6 antenna booms. The double probe will measure the field components from DC to 5 KHz. Outside the ionogram/skymap time windows the double probe voltages are continuously sampled at nominally 5 kS/s. The double probe design and processing is based on instrumentation that UNH developed and delivered for the MMS and other missions. Benefits: The DPTIS design is sufficiently flexible to fly on research missions in the F layer, both above or below the F2 peak for detailed studies of equatorial spread F and scintillations, or on a fleet of topside surveying missions for the mapping of the global ionosphere. Accurate near real-time topside electron density profiles can be ingested into the Global Assimilative Ionospheric Measurements (GAIM) model and will constrain the model in terms of foF2, hmF2, and accurate topside profiles to ~1,000 km altitude in all regions including those currently inaccessible with ground-based observations. Lowell Digisonde International, LLC participated in the Proposers' Day for the HFGeo Program on July 13, 2012 hosted by the Intelligence Advanced Research Projects Activity (IARPA), in anticipation of the release of a new solicitation for the development of ionospheric characterization technology in support of the High Frequency Geolocation and characterization (HFGeo) program. The event was held in the Washington, D.C., metropolitan area. The purpose of the Proposers’ Day was to provide information on the HFGeo program and its ionosphere characterization goals, to address questions from potential proposers, and to provide a forum for potential proposers to present their capabilities and find potential team partners. 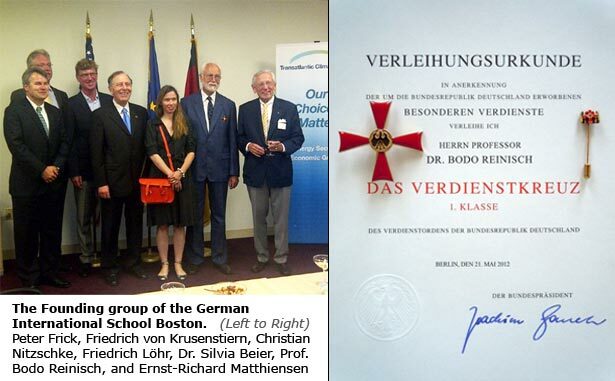 Consul General Friedrich Löhr decorated Professor Bodo W. Reinisch with the “Officer's Cross of the Federal Order of Merit” on Thursday, June 28, 2012 in Boston, Massachusetts. In his speech, Mr. Löhr honored Professor Reinisch in founding and presiding over the German International School Boston during the last two decades, and recognized his accomplishments in international cooperative research. For more photos and information please visit the German Missions Website. 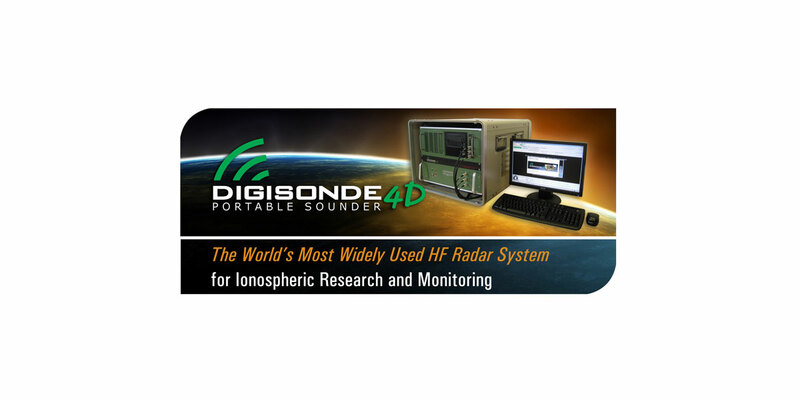 The Digisonde® sounder network for the Global Ionospheric Radio Observatory has again been expanded with the recent delivery of Digisonde® 4D systems by LDI. In 2011, LDI has delivered eleven Digisonde® 4D systems to clients in the U.S, Spain, Brazil, and Germany. LDI reports that seven additional systems are scheduled for delivery in 2012, to customers in the U.S., Brazil and Russia. Lowell Digisonde International, (LDI) is a participant in a new Seventh Framework Programme (FP7) project as the only non-European organization. This three and a half year project runs from November 1, 2011 to April 30, 2015. Through ESPAS, the project participants aim to provide the e-Infrastructure necessary to support access to observations, modeling and prediction of the Near-Earth Space environment.